Variety - the Children’s Charity has been stepping in where health care ends to help kids with special needs for over 51 years. Now we’ve initiated the Variety Kids Can campaign to focus on helping more kids and their families in BC. Variety Kids Can is a celebration of the remarkable achievements made every day by the kids Variety BC helps, thanks to the generosity of our donors. The help that Variety – the Children’s Charity provides in every corner of BC is the foundation of our organization. Parents of children with special needs often require extra support and Variety is where they turn. More and more BC families with children who have special needs are counting on us. Support Variety Kids Can so we can continue to be the organization parents can turn to when their child needs help. The goal of Variety Kids Can is to raise $2.5 millions for families who have kids with special needs. To kick off the campaign, the Milan & Maureen Ilich Family Foundation presented Variety with an astounding donation of $1 million. … and that’s just what Vancouver entrepreneur and philanthropist, Shafin Diamond Tejani did, with a half million matching contribution challenge of his own! Now it’s up to you to step up and help us reach our goal! 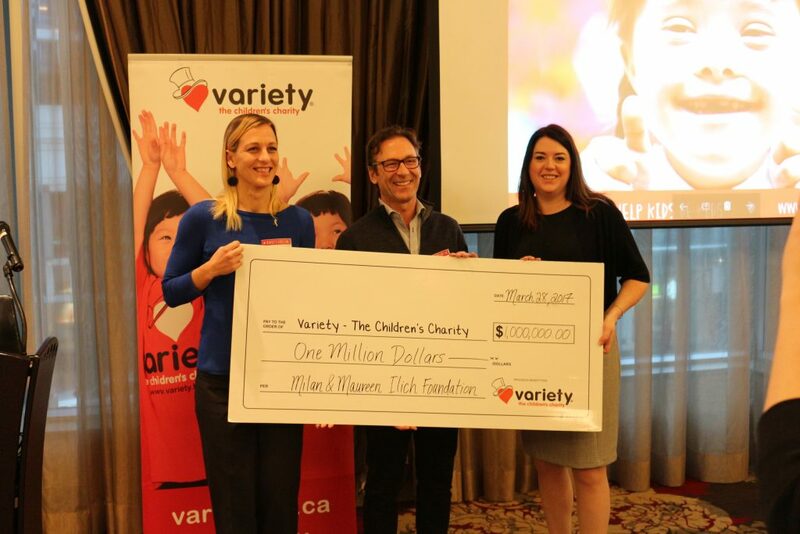 Rich Ilich, centre, presents $1 millions to Variety BC CEO Kirsty Gill, right. Also pictured, grant recipient Natasha Golinsky. Join us on social media! Use the hashtags #Igive and #VarietyKidsCan to share the reasons you donate, or share an inspirational story of a child overcoming an obstacle. Funds raised will go towards the Variety Kids Can 5 pillars of support.